President Donald Trump, left, meets with Canadian Prime Minister Justin Trudeau during the G-7 summit, June 8, 2018, in Charlevoix, Canada. 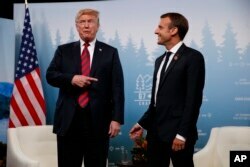 President Donald Trump meets with French President Emmanuel Macron during the G-7 summit, June 8, 2018, in Charlevoix, Canada. 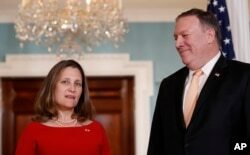 Canadian Minister of Foreign Affairs, Chrystia Freeland speaks with Secretary of State Mike Pompeo, before their meeting at the State Department, May 11, 2018 in Washington. 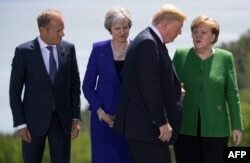 European Council President Donald Tusk,from left, British Prime Minister Theresa May and German Chancellor Angela Merkel look on as US President Donald Trump arrives for the group photo at the G7 Summit, June 8, 2018.